Runaway gaps occur in the middle of a trend. It shows the urgency of the market to join the fast-moving trend. Runaway gaps propel the trend. Hence, they offer opportunities to join the trend as it continues. Another useful feature of a runaway gap is that it tends to form in the middle of a trend. This means that you can use the price movement before the gap to project price targets. For this reason, a runaway gap is also known as a measuring gap. Sharp rising price action in a bull trend followed by a gap. Buy on close of gap day. Sharp falling price action in a bear trend followed by a gap. Sell on close of gap day. In the charts below, there are a few useful indicators/markers. The market trended upwards with only minor pullbacks. In fact, after crossing above the EMA, price has remained above it. This gap was not a huge one. However, as it occurred right after strong bullish action, it might be a runaway gap. With patience, the trade ran its course and hit the projected target. AXP rose sharply above the EMA and hovered above it. After such bullish price action, a gap presented itself. The gap volume increased a little but was not high. The market failed to hit the projected target. Instead, the gap was filled within eight trading sessions. The urgency (of the bulls) is clearer in the JPM example, where price rose without much sideways action. In contrast, AXP went sideways for around two weeks before resuming its way up. For runaway gaps, the urgency is an important clue to success. 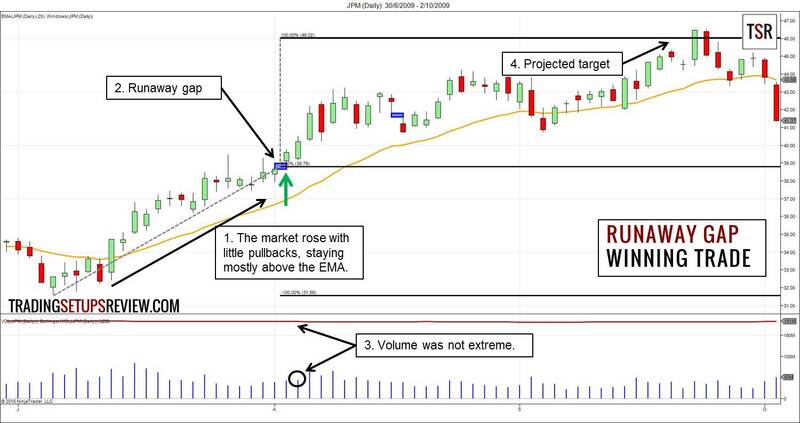 Swing traders cannot avoid dealing with price gaps. While gaps present risk that requires mitigation, they are also profit opportunities. 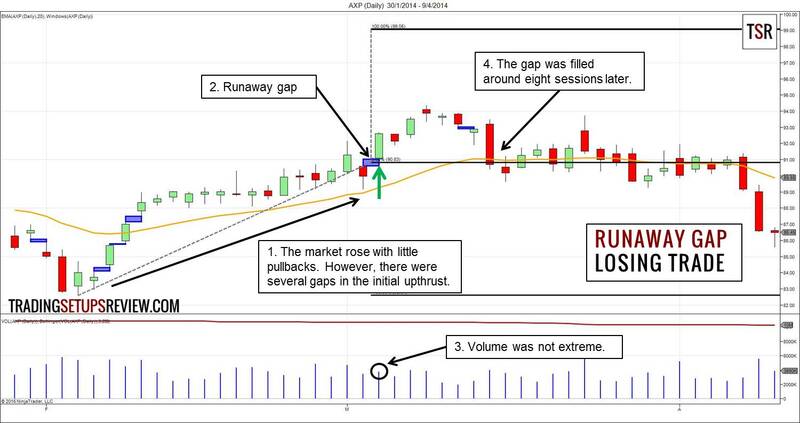 Runaway gaps are ideal for gap traders for the following reasons. They are, by definition, on the side of the market trend. 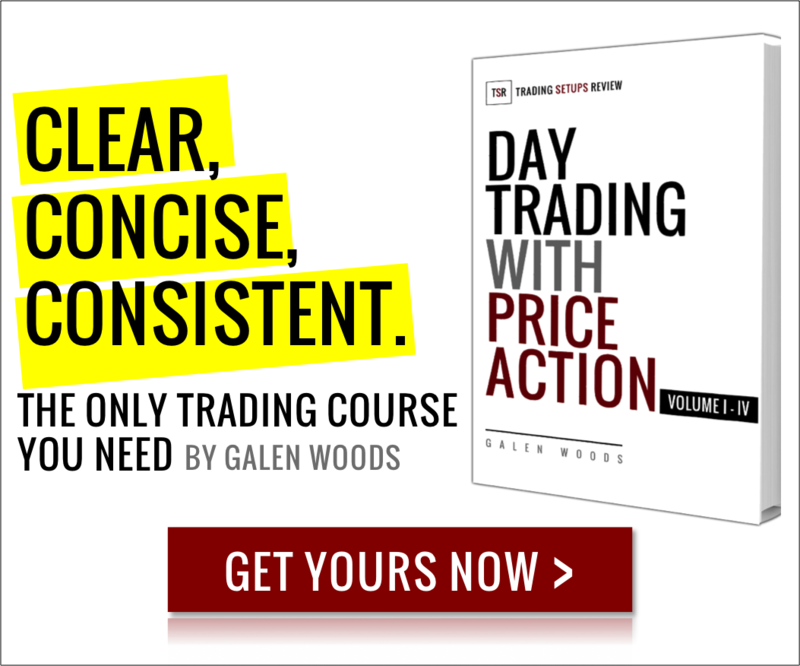 Trading exhaustion gaps goes against the trend; trading runaway gaps goes with the trend. Runaway gaps also offer price objectives for logical profit taking. But don’t use the projected target without observing the market structure. Major support or resistance might cause the market to stall before hitting the target. In such cases, target with caution. A runaway gap seldom fills before reaching its target. Use this knowledge to guide your stop placement. For a bullish runaway gap, place your stop-loss just below the gap. For a bearish gap, place your stop-loss just above the gap. Classifying the gap (as common, runaway, breakaway, exhaustion) is a critical step. However, no trader can classify gaps without error. Thus, you should combine gaps typology with other tools for greater efficacy.